Where Should I Be After 6 Driving Lessons? 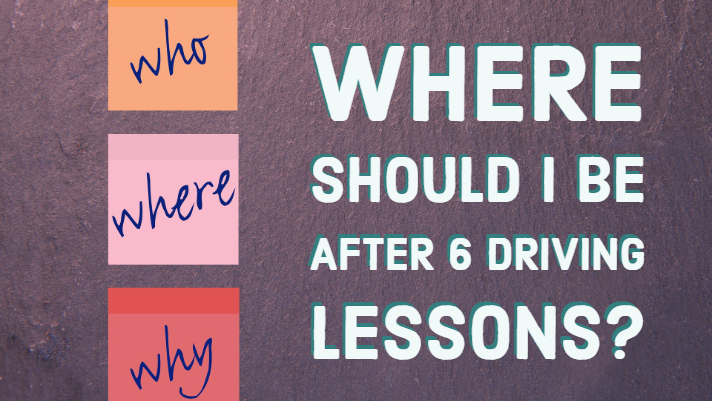 Home > Blog > Where Should I Be After 6 Driving Lessons? When learning to drive, it can be hard to try and chart your progress. Some learner drivers will take to the wheel more naturally than others, while for some, driving is a skill that takes longer to master. Everyone is nervous at first and will learn at different rates, but here is a general indication as to where you can expect to be after six hours of driving tuition. Six driving lessons is not a huge number – so don’t panic if you are nowhere near ready to take your test. The number of hours of driving instruction needed generally varies from around 15 to 50: there is no set standard. By your sixth driving lesson, you should have become familiarised with the cockpit of the car – knowing all of the controls and being confident in using them. You will be likely to have been taught how to change gear, when to use the handbrake, and how to steer. You will also have had some on-road driving experience, including moving off, signalling, clutch control, when to change gear and stopping the car. It is likely that you also will have practised kerb side parking, turning at T junctions. Depending on your progress, you may also have been taught to drive on dual carriageways, negotiate roundabouts, and may have learned one or more manoeuvres such as turns in the road, parallel parking, reversing round a corner and emergency stops. If you are ahead of this, then congratulations! If you are worried that you are behind, on the other hand, then don’t be: by learning at your own pace and taking time to get as comfortable as possible behind the wheel, you are likely to be a better driver when you do pass. If you are concerned, speak to your driving instructor – but remember, different people learn at different rates, and building up your confidence levels is key.